CNN sues the president: What does news have to do with it? 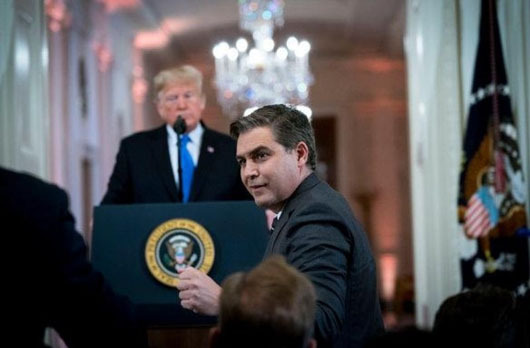 CNN, in a lawsuit filed on Nov. 13, accused President Donald Trump and other White House officials including White House press secretary Sarah Huckabee Sanders of violating CNN personality Jim Acosta’s First and Fifth Amendment rights by revoking his White House press credentials. Pundits and “media experts” have launched a spirited debate over whether the suit is appropriate or ridiculous given Acosta’s behavior at the widely-seen press conference that led to his “hard pass” being removed. But is this fight really about news and freedom of the press? But at least 16 major news organizations are backing CNN in its legal fight with the White House, including Fox News. “It is imperative that independent journalists have access to the president and his activities, and that journalists are not barred for arbitrary reasons. Our news organizations support the fundamental constitutional right to question this president, or any president,” a group of news outlets said in a joint statement on Nov. 13. The White House said Acosta was able to ask and had his questions answered, but went too far when he “refused to surrender” the microphone to a White House intern. Sanders continued: “CNN, who has nearly 50 additional hard pass holders, and Mr. Acosta is no more or less special than any other media outlet or reporter with respect to the First Amendment. After Mr. Acosta asked the President two questions – each of which the President answered – he physically refused to surrender a White House microphone to an intern, so that other reporters might ask their questions. This was not the first time this reporter has inappropriately refused to yield to other reporters. “The White House cannot run an orderly and fair press conference when a reporter acts this way, which is neither appropriate nor professional. The First Amendment is not served when a single reporter, of more than 150 present, attempts to monopolize the floor. If there is no check on this type of behavior it impedes the ability of the President, the White House staff, and members of the media to conduct business,” Sanders said.